Castle Cottage in Richmond, Yorkshire sleeps 5 people. Castle Cottage in Richmond has been restored to a high standard; this detached cottage offers luxury accommodation perfect for a couple or small group to enjoy a getaway with plenty of entertainment close by. 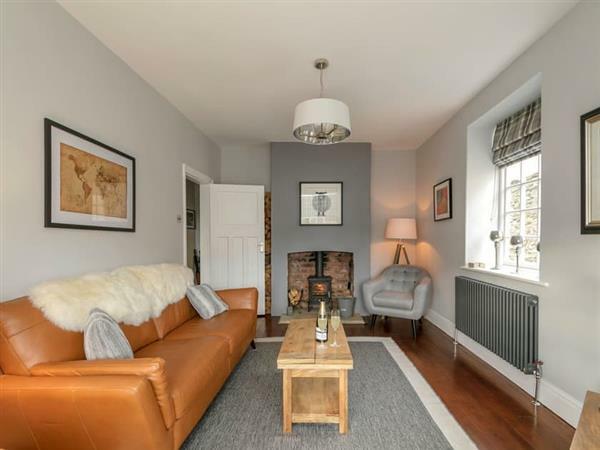 Decorated in subtle colours giving a feeling of calm and relaxation, there is a cosy living room with comfortable furnishings which invite you to curl up around the wood burner and enjoy quality time with your family or friends. With a Smart TV, Blu-ray/DVD player and Bose wireless speaker for your music, your entertainment is sorted whatever the weather. A separate dining room with table, feature fireplace and desk area mean you can spread out or entertain in style. The contemporary style kitchen has stylish grey units, oak finish worktops and all your modern appliances and kitchen accessories. Upstairs are three stylishly furnished bedrooms, two with double beds and the other with a single bed. With attractive accessories, sumptuous soft furnishings, crisp bedding and luxury toiletries, you will soon relax and unwind. Out and about you can literally start right from the door. Tucked away in a quiet courtyard, the cottage neighbours Richmond’s famous Norman castle and its grounds. The cottage is within a stones’ throw of the centre of this popular Georgian market town with its eclectic range of shops, restaurants and cafés. Richmond is steeped in history and is an architectural gem with its Georgian theatre, medieval abbey at Easby and picturesque market square where you can sit and watch the world go by. Explore the cobbled streets, enjoy some great shopping, take a picnic or enjoy a circular walk around the banks of the River Swale. The walk takes you past The Station, which has been restored to include a 3-screen cinema, a micro-brewery and bar, an ice-cream parlour, a delicatessen, an artisan bakery and a café with a gallery of local art. Next to The Station there is also Richmond’s indoor swimming pool. There is something here for everyone. Richmond sits at the gateway to the Yorkshire Dales National Park, making this the perfect base for outdoor enthusiasts to explore the sights of Swaledale and the Yorkshire Dales. There are plenty of riverside and woodland walks nearby which continue into the wonderful countryside beyond. One of the most popular walks is Wainwright’s Coast to Coast, which passes through Richmond taking you through some breathtaking countryside with amazing views. To enjoy the wider area visit one of the many pretty Yorkshire towns or villages, such as Thirsk, Ripon, Harrogate, Leyburn, Hawes or Reeth, all of which are close by. There is also the opportunity to watch the horse racing at Catterick and York racecourses. The cathedral city of Durham is just over half an hour away and is certainly worth a day trip to explore, as is historic Barnard Castle and Bowes Museum. The shop, pub and restaurant are all 50 yards from Castle Cottage in Richmond. Living room: With wood burner, 32 Freeview Smart TV and Blu-ray/DVD player with a selection of DVDs and games. Dining room: With Bose bluetooth stereo speaker. Kitchen: With double electric oven, induction hob, combi microwave/oven/grill, fridge/freezer, dishwasher, Nespresso coffee machine and washing machine. Gas central heating, electricity, bed linen, towels and Wi-Fi included. Initial logs for wood burner. Travel cot, highchair and stairgate available on request. Welcome pack. Dog cage available on request. Public car park. No smoking. Holidays at Castle Cottage run from Friday to Friday. Pets allowed at Castle Cottage. For a better idea of where Castle Cottage is, you can see Castle Cottage on the map below. Castle Cottage is in North Yorkshire; should you be on the lookout for a special offer, you can find all the special offers in North Yorkshire. It's always worth checking to see what is on offer at the moment. Do you want to holiday near Castle Cottage (UK10662), you can see other cottages within 25 miles of Castle Cottage; have a look to find your perfect holiday location.